The UN peacekeeping mission ended its operations in the Caribbean nation of Haiti after 13 years on October 15. 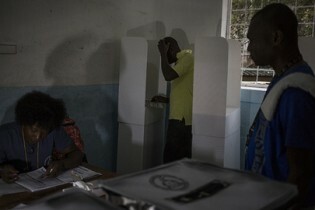 The UN Stabilization Mission in Haiti (MINUSTAH), which aimed to bring stability to a politically chaotic Haiti of 2004, will transfer power to the UN Mission for Justice Support in Haiti (MINUJUSTH), a much smaller successor mission that is going to assist the government on security issues. Six out of ten children in the world are not achieving basic proficiency in reading and mathematics, a new report by the United Nations Educational, Scientific and Cultural Organization (UNESCO) shows. On 23rd August, just days before thousands of Rohingyas began fleeing their homes from Rakhine State, Aung San Suu Kyi’s recently appointed Rakhine Advisory Commission, established in 2016, submitted its final report. The engaging of an independent Commission, tasked with recommending newer ways of improving the lives of Rohingya Muslims, Myanmar’s most deeply persecuted minority group, carried some weight of diplomacy. In February, when the government of Somalia sounded an alarm to the UN about risks of a famine in the country, the UN’s Office of Coordination of Humanitarian Affairs (OCHA), besides quickly shuffling a response team, was acting from a steep sense of history. The Office, instead of sending out massive aid packages, distributed cash vouchers to families who could spend it to buy goods according to their needs. The battle to reclaim Raqqa, the de facto capital of the Islamic State of Iraq and Levant (ISIL/Da’esh), has raised concerns among top UN officials as at least 20,000 civilians remain trapped under heavy fire in the city. Last week Monday, 42 civilians, including 12 women and 19 children, were killed in an air attack, according to the AP. United For Iran, a non profit group based in Berkeley, recently rolled out its latest mobile app Michka to open discussions about child sexual abuse in Iran, where treading into the topic is deemed as taboo. The United Nations Children’s Fund (UNICEF) has released new findings on the economic gains—besides the obvious health benefits—of breastfeeding. While voters in Venezuela overwhelmingly rejected President Nicolás Maduro’s plan to amend the constitution recently, similar tensions and a clash between protesters and state authorities appears to be brewing across the Atlantic in the West African nation of Mauritania. Jordan’s Zaatari camp, which opened in 2012 as a makeshift camp to house Syrian refugees fleeing the war, marked its fifth year on June 28. Seven million people die each year from tobacco-related deaths, according to a new report published by the World Health Organisation today. Discussion around the 2030 Agenda for Sustainable Development, a list of 17 goals listed by the UN, was all the buzz in the conference rooms of UN headquarters this week. More than two billion people lack access to clean and safe drinking water, according to a new report released by the World Health Organisation (WHO). The failure of European Union (EU) to buckle up safety for migrants and refugees reaching its shore has been condemned by Amnesty International in a report today. The benefits of ending child marriage are many—boosting a young girl’s morale and increasing her chances of education and work, and by that virtue, curbing high population rates in developing economies and boosting growth. As US-backed Syrian rebels plow ahead in the fight to take back Raqqa from the Islamic State in Iraq and the Levant (ISIL) in Syria, the stake of civilian lives, who number as many as 100,000 in the city, has raised concerns among top UN officials.